NBC 5's Kate Chappell has the story of how ComEd workers are feverishly working to restore power to those struggling to stay warm during this cold snap. There were roughly 19,815 people without power across the Chicago area early Wednesday. 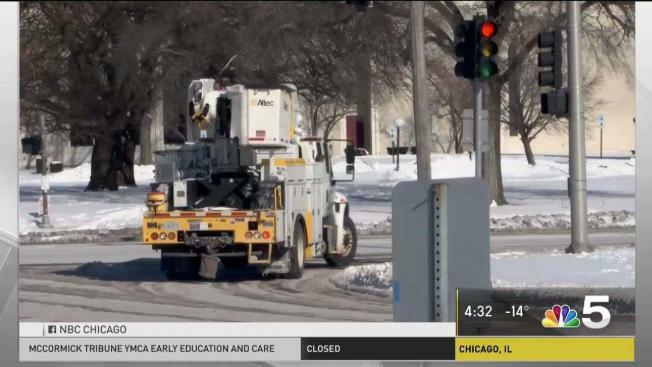 ComEd crews are braving freezing temperatures to restore power to thousands of area residents as near-record cold grips the area. Nearly 20,000 customers were without power at one point on Wednesday, according to the utility company, but as of 3:30 p.m. that number had dropped below 4,000 as crews worked to restore electricity to those affected. The vast majority of those customers are located in Cook County, as 2,677 customers remained without power Wednesday afternoon. Lake County was also impacted, where 785 customers remained without power, along with just over 150 people in McHenry County. In the event of an outage, ComEd urged customers to report it to the company by phone at 1-800-EDISON1 (1-800-334-7661) or by texting OUT to 26633 (COMED). ComEd also encouraged customers to call immediately if they spot a downed power line. Spanish-speaking customers should call 1-800-95-LUCES (1-800-955-8237). Those without power can locate a nearby warming center by calling 3-1-1. You can also call 3-1-1 to request a well-being check for someone who may be at risk due to the extreme cold. Never approach a downed power line, ComEd warned, and do not approach crews working to restore power as they may be working on live electrical equipment and the area could be hazardous. 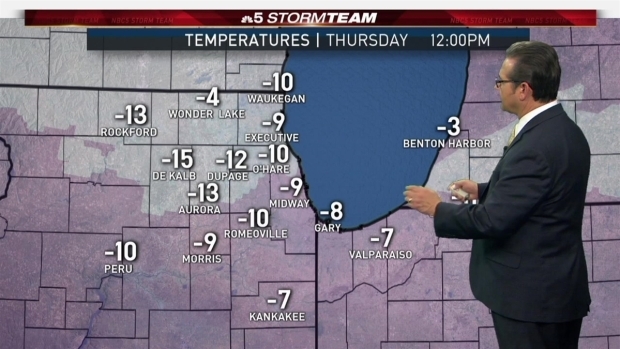 The entire Chicago area was under a wind chill warning that started Tuesday night and continued into Wednesday. Record-breaking and life-threatening cold hit the area overnight, with morning lows of -15 to -25 degrees with chill values between -45 and -55 degrees. Highs were expected to reach between -10 to -20 with dangerous wind chills through the afternoon between -35 to -50 degrees. Occasional snow flurries and strong wind were expected to create blowing drifitng snow with near whiteout conditions, especially in rural areas.